Donna Watson had been getting mammograms every year for nearly 10 years when she was diagnosed with Invasive Lobular breast cancer. At 46, the Hinesville resident, who works in the printing industry, had developed a routine: she got her mammogram a week or two after her annual gynecological exam. Although there wasn’t a strong history of breast cancer in her family, Donna was introduced to the impacts of cancer at the age of 4 when her grandfather died from brain cancer. 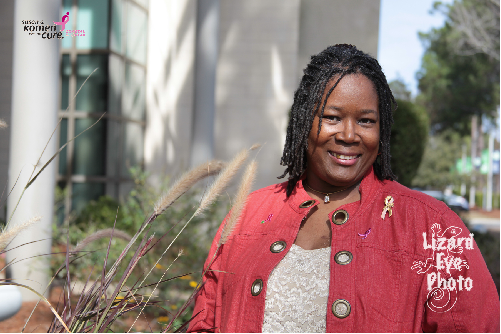 Then, one year before her own diagnosis, her oldest sister, Sandra, was diagnosed with stage 2 breast cancer. Sandra passed on January 23, 2012. “Don’t be afraid. A lump is not always cancer. It’s not always malignant. If you are diagnosed with cancer, that’s not always a death sentence. It’s better to know and get it taken care of,” Donna said. “The fear of the unknown keeps a lot of people from going to the doctor. There are foundations and money available so women can get their mammograms even if they don’t have money or private insurance. There’s no excuse not to have your mammogram,” she said. “It’s also important for women to be comfortable with and recognize the changes their bodies go through”, Donna said. “If you understand it better, it takes away the fear”. Donna said that Komen has and continues to be very vital in her journey (from the advantages of the research it funds to the local program it funds), but Survivorship Support has most impacted her journey because as a minister of the gospel, she has found that being a support for other survivors, newly diagnosed or long time, she is strengthened daily when she is available to encourage other breast cancer survivors because “there is LIFE after breast cancer; and LIFE CAN BE GOOD.” Donna also adds that a major aspect of her recovery process included support groups such as Young Survival Coalition, Circle of Compassion in Hinesville, Georgia, and participating in Susan G. Komen events.